You’ve finally found your dream job, but at the moment you are overseas. Flying back home can prove to be difficult and expensive. For many, this can be a major roadblock. It’s expensive to travel and coordinating dates with your potential employer can be messy. On top of that, there’s the chance that you may not be hired, and all the money you spent traveling wasn’t even worth it. Thankfully, Spark Hire has made searching for a job while overseas much easier. On Spark Hire, you can take part in interactive video features that connect you and your employer without ever having to leave your home. On Spark Hire, you can make great use of the profile video and video interview feature to make prospective employers overseas meet you face to face without ever having to hop on a plane. The profile video is a one-minute video you record on your webcam telling employers why they should hire you. It’s the perfect time to use your elevator pitch and put your face and personality to your resume. When employers look at your profile they’ll see all the standard hiring information such as work experience, references, education and specialties, but the video profile adds another dimension to your profile that other job search platforms cannot. This makes the hiring process easier for employers at home while you are overseas because they can see you beyond your resume and get to know who they may be working with. If an employer is impressed with your video resume, they may send you some questions to answer as part of a spotlight interview or invite you to participate in a live interview. A spotlight interview on Spark Hire is when you are asked a number of questions by your potential employer. You can answer them on your webcam at any time, thus allowing you to take the time to come up with thoughtful and informative answers. We all know how nerve-racking the formal job interview tends to be. We plan ahead our answers to the typical questions they may ask, but then there are those questions that always throw us off-guard and we try to compose ourselves and think quickly but also logically give the best answer. Spotlight interviews take away the anxiety of a formal interview and allow you to showcase your best responses to the questions employers ask. Employers can review your answers at any time and share them with their colleagues. If an employer wants to know you further, they can invite you to a live interview. Employers can conduct split-screen, online interviews anywhere in the world. That way, if you are stuck overseas, but know you are coming home soon, you can still interview for jobs. 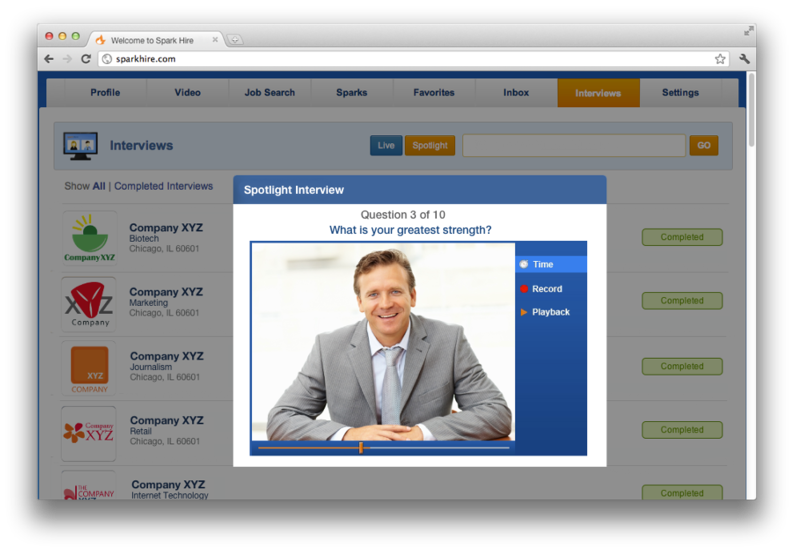 You can sit back and relax at home and interview with your potential employer via webcam. This is a convenient and cost effective way of looking for a job at home while you are overseas abroad. If you’re studying abroad, and looking for a job for when you return home, don’t wait until you get back home. You can look for a job right now on Spark Hire, wherever you are abroad, and secure a job in the U.S. that will be waiting for you when you return home. Take out the stress of rushing to find a job once you get home, and take advantage of the technology Spark Hire has to offer for your job search abroad. Hannah is an intern writer here at Spark Hire. She is from the northern suburbs in Chicago and is currently studying journalism at DePaul University. She has always had a passion for writing which is why Journalism has proven to be the perfect career for her. She has written for the DePaulia Online on various topics such as fashion, music, movies and television. She loves living in Chicago because it offers exciting events to write stories on. In her free time she enjoys going to music concerts, watching movies with friends, cooking vegetarian food and walking her adorable Cocker Spaniel Coco.